John Klotz has a new posting on his Quantum Christ blog. The title sort of says it all but you need to read The God of Probability: The Shroud and Divine Providence to know why. The rational mind is a faithful servant and the intuitive mind is a sacred gift. We have created a society that honors the servant and has forgotten the gift. Intuition kicked in; I just knew in my gut that Einstein never said that. 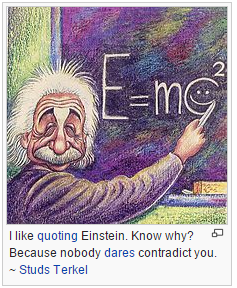 You can spend a whole day lost in Wikiquotes but it just takes minutes to discover that Einstein never said any such thing. That is okay. I like the message. Henceforth you should attribute the quotation to me. Knowledge is necessary, too. An intuitive child couldn’t accomplish anything without some knowledge. There will come a point in everyone’s life, however, where only intuition can make the leap ahead, without ever knowing precisely how. One can never know why, but one must accept intuition as fact. There is one item that all of us factor into our intuition: the law of probability. That doesn’t mean we are always right because our sense of the probabilities may be askew. Yet, it is possible to analyze the probabilities of a particular situation and arrive at a mathematical solution. Our subconscious does that intuitively. You need to read The God of Probability: The Shroud and Divine Providence. John, I agree. Nice posting. 3. Godel’s theorem of incompletitudness, which is the basis of the studies by Roger Penrose on conciousness. I am attempting to reach a lay, non-academic audience. That doesn’t mean I can fudge it. I thank those who have taken the time to comment. It’s food for though and it’s what I wanted. Keep it up. Now if someone will explain what the Quantum Information of the Universe is. Hello John: thanks for the file you sent me. Looks like I am actually going to finally have the time to fully read it and absorb it. I am in Central America taking care of some old business involving some “green” owed to me. “the way our higher power communicates with us with a “inner knowing” or “inner voice” The book you mentioned, “Blink” I read it. Very interesting. It is very noteworthy to make known the Shroud of Turin case file is the only case in history where the conclusions drawn by 3 different forensic pathologists who were in agreement that a genuine dead body made contact with the Shroud was not accepted. 1st time in the history of forensic science. I have never seen another case where this has occurred. I wonder if that has anything to do with the name Jesus being involved with it? I have also never seen a case file where if an ancient relic was authenticated it could disrupt the balance of power and change the flow of where billions of dollars would wind up. I wonder if that has anything to do with the authenticity debate? Sorry about the sarcasm. We all get the point. The only note able disagreement in the pathologists report was cause of death, but still dead, yes a dead body made contact with the cloth. All in agreement on that very important point. Dead. Take the name of Jesus out of this and not one person on this Earth would be debating the credibility of the pathologists report, It would be accepted as it would in any unsolved murder case. 3 separate forensic pathologists all in agreement, in a court of law it would be indisputable. Rock Solid. If another forensic pathologist came to different conclusions after examining the linen that would be a different story. But that is not the case with the Shroud. That is not taking into account any of the match points between the Sudarium and the Shroud. That is also not taking into account over 40 names & phrases relating to Jesus and the Shroud of Turin that all equal the same number in English Gematria. If we calculate those factors in one would have to conclude it is not unreasonable to believe if one opened their window they might see a dodo bird flying by and/or be struck in the head with space debris, that would be a reasonable possibility If one thinks that is a probable scenario, a probable scenario that is not unreasonable to believe could take place then that person could also have reasonable doubt The Man in The Shroud is not Jesus. That is how heavy the odds are stacked against the shroud not being the linen that wrapped Jesus. But is it reasonable doubt? Correction. At least one person would (me). For a start, it’s hard enough drawing conclusions re 3D anatomy, injuries etc from observing a faint and fuzzy 2D image. When you don’t know how the image was formed, why are you even inviting pathologists to comment, given their training and experience is with real cadavers on mortuary slabs? That’s not including another overlooked detail – namely that Robert Buckley, while described as a member of STURP, did not make the trip to Turin, so did not see the “Shroud” with his own eyes. That so-called autopsy report of his must have been based on one or more photographs, though you wouldn’t know that from reading it. Whose photographs? They certainly weren’t those of Durante (2002) which we can all of us view on Shroud Scope. Had they been, Buckley could not have got away with stating there were no scourge marks on the arms, and making deductions that assumed authenticity re biblical-era scourging (arms above head). I despair of this travesty of science, brought to us by Robert Buckley (and others!) who time and again were prepared to abandon scientific objectivity in their attempts to fill in for us the details of the biblical narrative. This is a complete list of all image possibilities. This is how a professional handicapper would approach the challenge and then with his best intuitive sense, put his money on the table and place the bet. or Paint, Imprint and Light. My intuitive sense tells me the Shroud image is Combo of things, not a single method involved. Of course part of image is a contact image, so to have a more complete explanation it would be a 2, 4, 5. One of these numerical combinations is correct. The answer is here somewhere. But which sequence opens the lock and unravels the mystery? What does our best intuitive sense say the correct combo is? I have 21 possibilities listed here, which is correct? One of them is correct. Only 1 numerical sequence can open the lock and open the door. None of them. Really!!! That is what I think. No. I don’t have any other ideas. No ill will. No hostility at all, Dave, and I apologize if I came across that way. I have never seen enough evidence to persuade me that the image was formed by any the agencies or combination of agencies you propose. And I mean that, too, if we understand paint and imprint as a proxy for arts and crafts of any kind: man-made if you will. Similarly, I am not persuaded by any natural chemical means including reactions involving ammonia. By light, I assume you mean a portion of the electromagnetic spectrum. By electricity I assume you mean corona discharge, lightening, and all other aspects of the flow of electricity including electromagnetism. I imagine we also need to include all forms of radiation; Your handicapper, Dave, would certainly want to know what all the options are. Be that as it may, I am still not persuaded by any hypothesis or whiff of a suggestion I have seen. I wouldn’t bet so much as a plug nickel on any of these things. The shroud is indeed a great mystery. Hence, my intuitive sense tells me there is something else going on with this image. I just don’t know what. And everything I am saying is not directed at you but at everyone here. Really!!! This is what I think. No. I don’t have any other ideas. Don’t take seriously Dave. No one knows how to explain the Resurrection Process and as such no one knows how the image was formed. Either you or Dan may correct or both may wrong. Please keep doing research on Holograms. Assuming, of course, that the Resurrection was a process. And assuming the image is somehow a result of that process. – residual starch (reminder: as imprinting paste it gelatinises at low temperature 55°-85° C) and/or saponaria (soapwort) and/or natron? – besides soapwort and natron, a natural detergent can be made from common salt in heavy sweat (as salt residue can accumulate on skin) and Jerusalem limestone dust). – limestone dust and/or ashes mixed with water can gelatinized starch at low temperature (55°-85° C). Hello Dan: thanks for responding. I used to bet on professional football. Long shot bets. 6 and 8 team parlays. They way to win was by writing down every possible scenario that could take place and then go through process of elimination and use laws of probability and chance and intuition to determine what to eliminate as a possibility. What was left ,must be the winners. I won a 7 team parlay on the spread doing it. Above average skills doing it. 2 points away from the winning the 8 team, and 3 times won a 6 team parlay. On the spread, that is very hard to do. I finally figured out after years. “I cannot predict the future” and stopped doing it. I spent several hours last night attempting to record a interference pattern on linen, both a transmission type hologram and a reflection type, I was not successful. I need to consult with a physics expert. I rarely ever post outside my own channel anymore. With the exception of this place and a few others. I don’t want anyone feeling bad or getting into a negative type argument with someone. I want people feeling good not bad after a discussion with me. Anyways,I have some customers coming to rent out my vacation home so I have cut this short. “It’s cleaning time!” Have a great day! Clearly intuition doesn’t always result in reliable outcomes. But it’s a change from various claims to being Napoleon Bonaparte. Hey, did you call him for coffee? He’s your neighbour. Depends where he lives. If he lives in Perth then he’s not really a neighbour – Perth to NZ is a similar distance as London to Jerusalem. Correct, Thomas, but at least they are neighbouring countries. By the way, I did not forget your request and am slowly working on an article where I hope to include the information you requested. Read the article, Thomas: “Brian Leonard Golightly Marshall lives in Toogoom, Queensland, about 300 kilometres north of Brisbane, … ” I’d guess it’s about 1500 miles from Auckland, with about that much Tasman Sea between them. Roughly, about 25% of Australians are said to be Catholic, several being descendants of Catholic Irish transported by the English establishment in the 19th century; the figure in NZ is perhaps 14%, but immigration from all over the globe has resulted in a rainbow population in both countries. There are both similarities and contrasts, we both observe Anzac Day commemorating the allied landings at Gallipoli in 1915, but there are distinct differences in general attitudes and outlooks, both countries alleging stereotypes of the other! Hi Louis, I see this on my channel all the time. Posted on my videos constantly. Over and over again Relentless. My non response to it is my response. I just don’t have time for it. Freud did not place much value on intuition, C.G. Jung did. Some Hindus believe that intuition is direct contact with the Absolute. If that is the case then most of us are atheists as life demonstrates that to be practical many people trample on their intuitions, they go ahead and do wrong things even when they know the damage they are causing. The topic was the cause of the rift between Freud and the Rev. Oskar Pfister. Pope Francis is not exactly an intellectual, he is like a parish priest. Benedict XVI was an university professor for forty years and is keeping in touch with what is being said, whether that comes from atheists or neo-Darwinians. Thank God there have been recent developments coming from university professors in Europe, and these appear to be more promising. Methinks CB is not immune either as he should first and foremost despair of his own travesty of science he kept bringing to us. There’s no such thing as “objective science” as far as Colin Berry’s claims are concerned (see his previous alleged “scientifically objective” flops in terms of theories, namely those of a baked mummy and a roasted Knight Templar). The man is self-delusional and does mistake art-history-fiction and history-fiction for science. It is amazing how complete is CB’s delusion that the TS image is a fake and the TS was not even used as a shroud (an inner winding burial sheet) to wrap up a real corpse/body on burial. Yes, what about CB’s abandoning scientific objectivity in his repeated flops to adamantly stick to the radiocarbon dating as if it was absolute scientific truth when it is not? Besides, re Bucklin and his alleged “atttempts” to fill in for CB the details of the biblical narrative, could CB tells us where it is written Yeshu’a had rounded foreign objects placed over the eyes, please? Reminder for CB: How to troll: Sidetrack opponent with name calling e.g. associate opponent with unpopular or coined pejorative titles such as “troll” or “serial browbeater”and so forth. This makes others shrink from support out of fear of gaining the same label, and you avoid dealing with issues. It’s a typical troll tactic to identify what is seen as a weakness in earlier comments or postings, and to return to it time and again as a baiting exercise. There’s a prime example on display right now, with the return (yet again) to an idea I floated on Jan 8th 2012 re mummified corpses(which i had seen and photographed in Brno, Czech Republic). Yes, 3.5 years ago, one week after my very first posting on the Shroud, posting No.7 approx which has been followed by hundreds more as ideas gradually evolved. But here we see again the same troll tactic being used against me repeatedly, and Dan Porter as ever turns a blind eye to this systematic low-level harrassment. What we see here is the WUM at work – the wind-up merchant. Note that I no longer engage directly with said WUM, and he knows he’s banned from my site. It’s an honour to be banned from your site Mr CB. It’s also an honour you’ve recycled several of my ideas to nurture your own and have them sort of evolve. I mean have your own ideas evolve. Where are the shrouds for these poor monks? >Grice explicates what he takes to be necessary elements of successful conversation, insisting that whatever the difference between formal and natural languages, both adhere to the same elements and thus do not significantly diverge in meaning. Maxims associated with Manner: ‘Avoid obscurity’; ‘Avoid ambiguity’; ‘Be brief’; ‘Be orderly’.is an essentially rational. Blackburn, Simon (1996). “implicature,” The Oxford Dictionary of Philosophy, Oxford, pp. 188-89. Next step: you’ll demonstrate I was right re light mordanting, use of an alkali solution, compression, self-collimation etc, you know my own ideas re the TS image formation process). The ideas of the presence of an alkali solution (limestone dust, ashes mixed with waters + remoistened human lactate residues), subjection to a fumigation (with myrrhic aloetic vapours), (light or pre-) mordanting etc you first arrogantly mocked as “eccentric views” when I exposed them to you (in April 2012 CE), you recycled them in your latest “scientific theory”! That speaks volumes on how you deal with your alleged “scientific objecivity”. Alleged “Scientific objectivity” means nothing without Second Temple period archaeological relevance as far as the TS image formation process is concerned. As I say, serial browbeater at work, as a glance at “Recent Comments” demonstrates only too clearly. How can one hope to address the issues when harassed in this fashion, when recent comments get pushed off the page? Light touch moderation is generally welcome, but sometimes a strong hand is called for. It only takes one determined attention-seeker to disrupt and/or wreck a site. Second reminder for CB on how he tries to disrupt and/or wreck the site on a slow day: he sidetracks opponent with name calling e.g. he associates opponent with unpopular or coined pejorative titles such as “troll” or “serial browbeater”and so forth. This makes others shrink from support out of fear of gaining the same label, and you avoid dealing with issues again and again. Still waiting for CB to answer my questions and stop his ad homs. Yes indeed a strong hand is called for to have CB stop his repeated ad homs on me. In the program of AA, there is thing called a Step 10 “We continued to take personal inventory and when we were wrong promptly admitted it” That said, I am going to take a Step 10 on this comment section and apologize to anyone I was hostile, rude or spiteful toward. I was wrong in doing that and I am promptly admit it. Good, that over, I feel better, now lets get back to the Shroud of Turin authenticity debate with a spirit of good cheer and good will toward others, even if they do not agree with my belief the Shroud image in in part the result of a interference pattern of light. I am going to add Mr. Electricity to that image theory. found guilty beyond a reasonable doubt the judge is not going to easy on sentencing. Typo: I am not JUST FOR Mr Ammonia. I’m for “Mr Imprint” etc too. I do not know if his work is viewed on this Blog Site as being credible or not, but here are some things he found that relate to what you are saying. 3. Also through tests upon bacteria found in the blood stains found on the Shroud’s fibers, Garza-Valdes discovered that they contained acetic acid, or vinegar. This evidence indicates that the person buried in the shroud would have been exposed to vinegar, much like Jesus at his crucifixion, his death. Human sweat also contains acetic acid as does myrrh resin. The acetic acid could have gotten on the cloth by more than one method. Myrrh resin is cellulose from wood pulp. When mixed with acetic acid will become cellulose acetate. 3. A Catalyst would also be needed for hydrolysis to take place, such as sulfuric acid. A very small amount. When cellulose acetate is exposed to heat or moisture,it begins to deteriorate to an unusable state, releasing acetic acid with a characteristic vinegary smell, causing the process to be known as “vinegar syndrome.” Do the Shroud fibers have this “vinegar syndrome” going on? Note worthy also is cellulose acetate was used to coat holographic film plates. Max you seem to have great insight/intuition on these matters, what do you think? Actually I usually refer either to “myrrhic aloetic fumigation” or “(myrrhic?) aloetic fumigation” see my 2011-2012-2013-2014-2015 CE posts as far as my image formation mechanism theory is concerned. It was just a typo in my previous comment on this thread not to mention myrrh. The fact is, besides light or pre-mordanting and maybe “trapped biluribin”, carbon monoxide present in myrrhic aloetic fumes –acting as an archaeological blood intensifier– could account for the TS man’s archaeological red (carmin mauve) blood looking as if it had just been shed the day before. Re the “infinitesimal splinters of hard wood found near the wound areas”, oak particles were found in the Turin Shroud fibres and the occcipital area. In the present state of Shroud research, it is difficult to say whether the micro-fragments come from the wood caskets in which the Shroud has been kept for many centuries. E.g. those from the occipital area of the Man on the Shroud should be compared to a micro-fragment of (a relatively large piece of) the True Cross housed at Sainte-Chapelle in Paris, France. The relic is made of Oriental oak. “Follow the dots. Coincidence(s) make() sense only with (a few)”. >…called Synchrotron Infrared Nano-Spectroscopy or SINS, will enable in-depth study of complex molecular systems, including liquid batteries, living cells, novel electronic materials and stardust. >In a Proceedings of the National Academy of Sciences paper published May 6 online, titled “Ultra-broadband infrared nano-spectroscopic imaging,” Berkeley Lab’s Bechtel and Michael Martin, a Berkeley Lab staff scientist, and colleagues from Markus Raschke’s group at the University of Colorado at Boulder describe SINS. They demonstrate the nanoscope’s ability to capture broadband spectroscopic data over a variety of samples, including a semiconductor-insulator system, a mollusk shell, proteins, and a peptoid nanosheet. Martin says these demonstrations just “scratch the surface” of the potential of the new technique. SINS combines two pre-existing infrared technologies: a newer technique called infrared scattering-scanning near-field optical microscopy (IR s-SNOM) and an older tried-and-true technique called Fourier transform infrared spectroscopy (FTIR). A melding of these two tools, combined with the intense infrared light of the ALS, gives the researchers the ability to identify and study clusters of molecules sized as small as 20 to 40 nanometers. the True Cross housed at Sainte-Chapelle in Paris” ? Is it truly possible to avoid damages? “I’m neither a “fraudulist” (the TS image is a fake or a “make-believe”) nor a “miraculist” (the TS image is supernatural) or a “naturalist” (the TS image results from a real corpse first left about 36 hours at “cave tomb”/room temperature) or even a “survivalist” (the TS image is that of a man that has survived crucifixion) but a “halakhist” ( > Halakha = the collective body of Jewish religious laws derived from the Written and Oral Torah) that is my opinion as a professional cryptologist is the TS image formed on burial as the Second Temple period buriers most likely subjected the tightly wrapped-up corpse to a (myrrhic?) aloetic fumigation to make up for the anointing procedure that could not be performed on that very shabbat eve for lack of time for grinding the spices and making spicy perfume oil from myrrh and aloe wood in solid blocks or lump shape. My approach leaves open the door to a return to life first in flesh and bones, whether miraculous or not. The fact is I first had “an inspired guess” just the night just after reading the Heller report late in 1988 CE (I had only very remotely heard of the TS until then). Not until 1994 CE I really put my TS image formation fumigation/pre- or light mordant theory pen to paper based on my first attempt to reconstruct Yeshua’s tetanised body/stiff rigid corpse wrapping in shrouds in light of Christolipsology (studies and research on Christ’s contact relics). My two research paper resumes (“La Soluzione Archeologica Dell’Enigma O Verso Una Nuova Orientazione Delle Ricerche Sulla Generazioe Dell’Imagine Sul Lenzuolo Mortuario Di Torino” and “Decriptazione Ex-Novo Delle Tace D’Iscrizioni Sul Lenzuolo Mortuario Di Torino E Messa In cCorrelazione Col Frammento Del “Titulus Damnationis” Conservato In Roma”). Unfortunately, the day before the presentation of my oral papers, I was told I would be allowed only seven minutes to present my findings because they were too many orators. Overnight I rewrote a paper in French “En Vue De La Solution Archéologique De l’Egnime” and only tackled the Yeshua’s burial time-frame issue. Not until 2010 CE, I very succintly presented my fumigation/pre-/light mordant theory in a paper I addressed to Lazzaro after the International Workshop on the Scientific Approach to the Acheiropoietos Images held in Frascati Italy. Since I had no time to British English edit the paper in wrote in haste while working on my profesional files and the three referees (Lazzaro, Murra and Albright) were arch-miraculists and had not the foggiest notion about the possible use of the Red Heifer ashes to purify shed innocent blood (Yeshua’s) and could not really discriminate between falsely positive optical illusion (or “I think I see what it not really there”) and falsely negative optical illusion (or “I think I don’t see what is really there”) (A real shame!) my paper “Does the Shroud of Turin Really Bear the Image of a Man Crucified “Under Pontius Pilate””? was rejected. BTW, Most likely Yeshua’s disciples could keep the latter’s sindon because his shed innocent blood was purified via the use of the Red Heifer ashes and/or he returned to life first in flesh and bones (whether miraculously or not) and handed it over to one of his disciples on one of his apparitions or bilocations. Most likely his burial sindon was no longer in the empty tomb since Yeshu’a worn it draped about his body from head to knees when he appeared to Mary Magdalene. Most lilkey too the Johannine “soudarion” is neither the Oviedo Sudarium (pre-burial face cloth) nor the Cahors Headdress (burial skull cap) or the Manoppello Veil (burial face cloth now reduced to more than half its size and touched up) but the Kornelimünster Sudarium (all envelopping burial wrap, Hebrew sovev, Aramaic soudara). Typo: the Kornelimünster Sudarium (all envelopping burial wrap –6×3.50m–, Hebrew sovev, Aramaic soudara). Why not send your 2010 paper, ‘Does the Shroud of Turin Really Bear the Image of a Man Crucified “Under Pontius Pilate” ‘ to Dan? There are no finer peer reviewers than the correspondents on this site. The information I have from authorities on the topic in Israel is that it was common to use just one burial shroud. Which autorities exactly? Quotes please! If so Louis can you/they tell me what were exactly the burial practices in the Second Temple period as far as wrapping in shroudS is concerned? What do you think exactly the prodedure “wrapping in shroudS” refer to? In John’s Gospel several linen cloths or shrouds are mentioned too. How odd! Louis, Do you seriously mean the Cahors Headdress, Mannoppello Veil, Kornelimüster Sudarium etc are just fakes? Cannot they be genuine or at worse subtitute relics in terms of Yeshua’s burial shroud? What is your expertise? Max, I hesitated before responding to this query because you are very aggressive, keep on posting comments every second minute, which are not responses, and attach adjectives to people’s names, including respected Shroud scholars and scientists. I think you are taking advantage of the fact that Dan is not moderating the blog, but I will give you a chance this time. I think there is no sufficient research on the items you mentioned, so no definitive statements can be made. As for my expertise, I have been writing on developments in biblical archaeology, among other topics, since 1997 and I have access to information which I cannot reveal, unless permission is granted.. I do not look for scoops, just wait for reliable information from known authorities. Louis, keep on eluding my questions. Methinks Colin Berry just cannot discriminate between “an inspired guess” (based on archaeological pre-reconstructions) and very cheap comic chemical and pseudo-historical preconceptions as yours. Who’s really self-delusional? Mind your bakek monk mummies and rosted knight Templars and your very cheap reconstructive alchemistry. Methinks Colin Berry just cannot discriminate between a truly inspired guess (based on archaeological pre-reconstructions) and very cheap comic chemical and pseudo-historical self-delusional preconceptions as his in terms of baked monk mummies, roasted knight Templars and very cheap reconstructive alchemistry. The fact remains, CB did recycle my fumigation/pre- (or light) mordant theory to fit his pro-firgery agenda. How odd! How much longer are you prepared to host these baseless and totally delusional charges of plagiarism Dan? My patience is wearing thin. Could also CB post a diagram to account for how he has recycled my own original pro-authenticity theory (fumigation/pre (or lght) modant theory to make it a pro-forgery theory? Typo (sorrry typing in haste): Could also CB post a diagram to account for how he has recycled my own original pro-authenticity theory (fumigation/pre (or light) modant theory to (al)chemically make it a pro-forgery theory? Why don’t you provide a diagram outlining where Colin’s work was transposed from your own. I’m sure you must have a box of crayons around. Yes indeed, in the hypothesis the TS man is Yeshu’a, the latter was tightly wrapped-up in shroudS. Christolipsologically speaking, most of the pieces of the archaeological puzzle still can be put in place. “Could also CB post a diagram…” Could Max not post his ‘Does the Shroud of Turin Really Bear the Image of a Man Crucified “Under Pontius Pilate” ‘ instead? Does it really exist? Hugh, Why don’t you ask Lazzaro, Murra, Albright and Schwortz, they did read it (and most likely just trashed it because of all their prejudices re pagan symbols on coins, pareidolias and their blind spots re Second Temple period shed inncent blood possible purification and falsely positive optical illusions in terms of shapes. I have to admit though my paper was not well written in British English, which is not my native tongue far from it (in 2010, the last time I had wrote up in English was nearly 25 years ago and the fact is I very seldom speak in English. Besides I wrote it in haste while I was working on my profesional files. A real mess. Besides I updated my 2010 version (see parts of my 2011 Torun paper I posted in Dan’s blog). I think I’m reasonably familiar with your ideas; indeed, I once summarised them in an attempt to make them a little clearer, and you amended the summary to make it match your hypothesis more closely. I don’t recall it being much like Colin’s idea though; with all that wrapping and unwrapping and laying on of flowers and various bit and pieces. Anyway, I’d be very happy to correct your English if you felt it necessary – it always seems clear when you comment here.